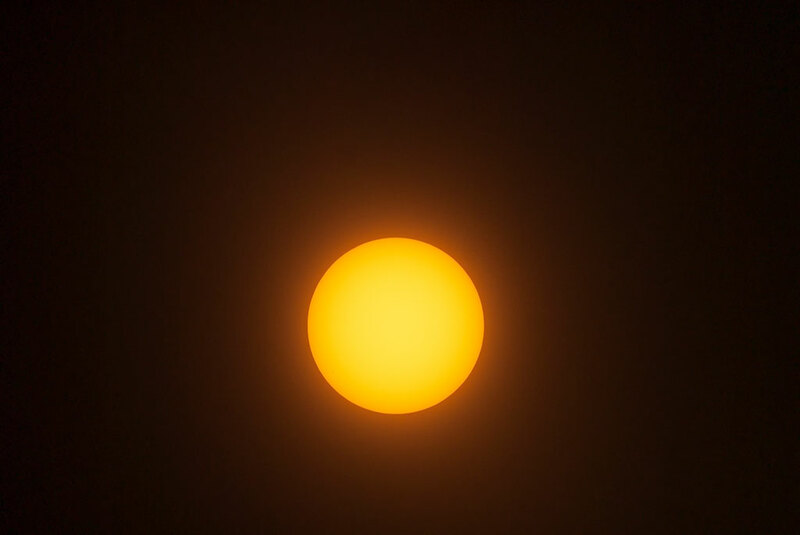 This is a test image of the sun I made today under hazy skies, shot with my 400mm f/3.5 Nikkor, my 1.4x Nikon teleconverter, and a small piece of “eclipse glasses” film on the 39mm drop-in filter in the lens. The first total solar eclipse to cross the continental Unites States in many years is just six days away, and along with half the country, my wife Abby and I are preparing to photograph it. When I first discovered this event, five years ago, I wrote a blog post called Assignment: Team Blackout. It was my feeling that Abby and I and a few friends and/or fellow photographers would make a two-day trip of it, and it would be fun and easy. As those five years have passed, and especially in the last few weeks, I am having misgivings about the whole idea, since it is starting to be reported that everyone and their dogs (and our dogs) will be mass-migrating to a spot under the path of totality to witness and photograph this event. 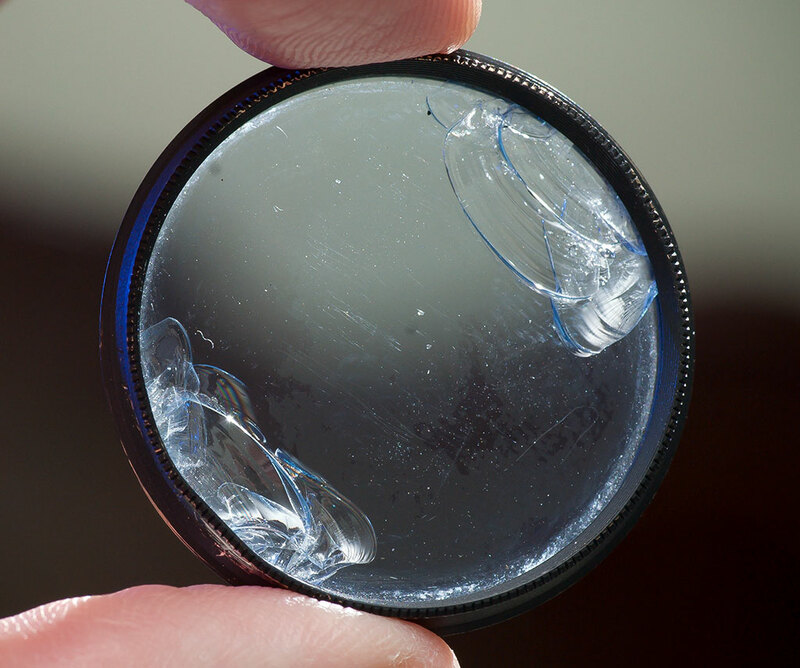 During tests today to photograph the sun, this 39mm filter got stuck in the filter holder, possibly cross-threaded, and had to be forcibly removed with a Vice-Grip, permanently damaging it. Fortunately, it is an obsolete #82A color correction filter, and I have three other filters that will work. I was excited, but now I am just stressed. I have a mental image of Abby and me sitting in the truck on I-44, without moving for five hours, because the highway system is totally overwhelmed by the flood of dilettantes and dabblers, and not only will we miss the event, it will be boring and miserable. That’s a worst-case scenario, of course. It is based partly on the fact that a Quality Inn already sold a reservation out from under us, one we made months ago. It also takes into account media frenzy that loves to froth at the mouth in advance of a disaster. My photographic plan is fairly straightforward. I am relatively uninterested in photographing the crescent photosphere. Of main interest to me is the stellar corona visible during totality, the beautiful but faint, airy, high-temperature aura of plasma that is only visible during an eclipse or with expensive masking instruments. A second-tier item would be Bailey’s beads, which is the sun diffracted around mountains and valleys on the lunar surface, and the “diamond ring” effect just as the sun disappears behind the moon. If it’s cloudy where we are, I will be disappointed, although my sister, who hopes to join us along with her husband, pointed out, day will still become night and it will remain an experience to remember. 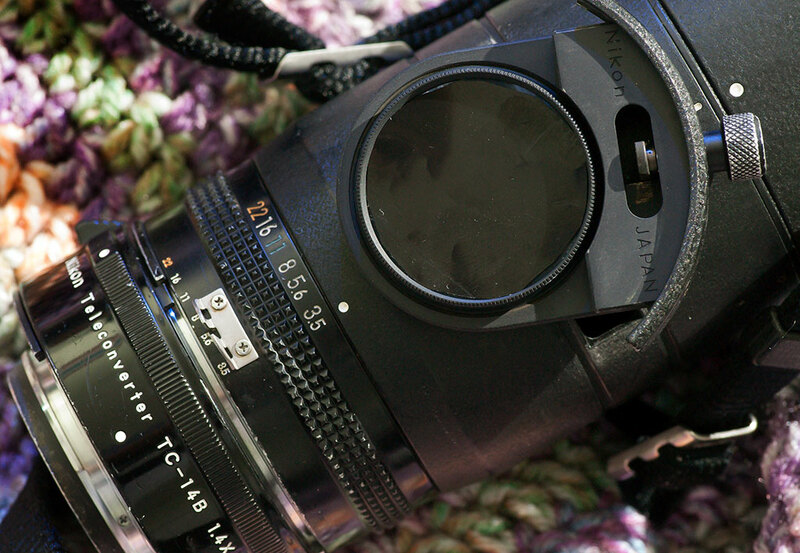 This is the camera-end of my 400mm f/3.5 Nikkor with the excellent 1.4x converter attached. The 39mm filter sits in a slot, shown here pulled out and laid on the lens so you can see the piece of “eclipse glasses” I am using as a solar filter. I share some of your misgivings. Happily, our hotel in St. Louis didn’t ditch us, so there’s that, but I still have visions of hurricane-evacuation-level traffic snarls. That said, the eclipse will take place whether we’re huddled against the shoulder of I-55, or happily sitting in our camp chairs in some lovely state park. I do so hope we can all be together for it, though. Be careful! My pastor said that when the eclipse happens, the mouth of Hell will temporarily open directly underneath! Oh wait. I don’t have a pastor, and I don’t believe in Hell. You should be fine.